"Sampath Speaking" - the thoughts of an Insurer from Thiruvallikkeni: Will Scotland become a new Nation - votes in referendum !! Will Scotland become a new Nation - votes in referendum !! 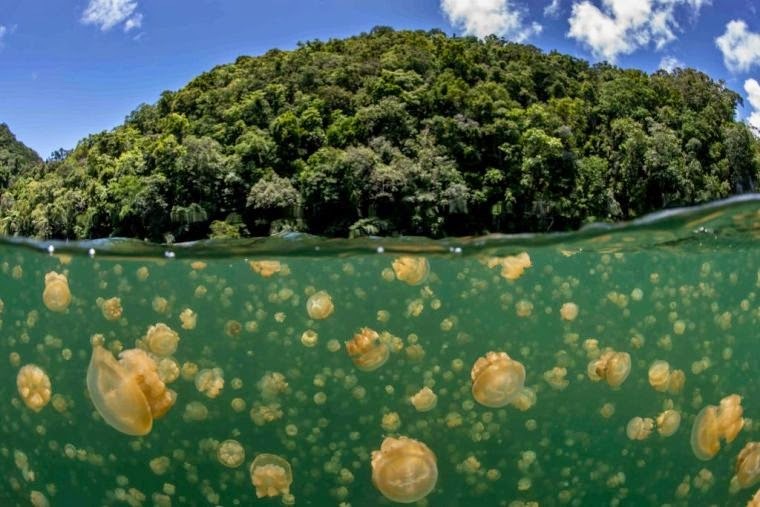 It is famed for ‘jelly fish’ known as Jellyfish Lake located on Eil Malk island in Palau. Millions of golden jellyfish migrate horizontally across the lake daily. Palau is a Country (yes an island country in Western Pacific) with population of around 21,000, spread across 250 islands. After eight referenda and an amendment to the Palauan constitution, it became independent in 1994. Now the World attention is on ‘Scotland’ – the country that covers the northern third of the island of Great Britain and is part of the United Kingdom. It shares a border with England too. In addition to the mainland, the country is made up of more than 790 islands. Edinburgh, the country's capital and second-largest city, was the hub of the Scottish Enlightenment of the 18th century, which transformed Scotland into one of the commercial, intellectual, and industrial powerhouses of Europe. Glasgow, where the Commonwealth games were held recently is its largest city. The Kingdom of Scotland emerged as an independent sovereign state in the Early Middle Ages; Scotland subsequently entered into a political union with England in 1707 to create a single Kingdom of Great Britain. Scotland's legal system has remained separate from those of England and Wales and Northern Ireland, and Scotland constitutes a distinct jurisdiction in public and private law. Today is an important day as people in Scotland have begun voting on whether the country should stay in the UK or become an independent nation. Voters will answer "Yes" or "No" to the referendum question: "Should Scotland be an independent country?" With 4,285,323 people - 97% of the electorate - registered to vote, a historically high turnout is expected. Votes will be cast at 2,608 polling places across the country until 22:00 on Thursday. The result is expected early on Friday morning. Ballot papers will be counted in each of Scotland's 32 local authority areas. In 1999, the parliament in London started to transfer some powers to Scotland, Wales and Northern Ireland. In 2009, Scotland's parliament decided to go a giant step further by pushing for an independence vote. Two years ago, British Prime Minister David Cameron agreed to allow the referendum to take place because the case for independence seemed weak at the time. Supporters of independence want direct control over their affairs. Scots tend to be left-leaning and chafe at the policies embraced by the ruling Conservative Party in London. In the most recent general election, just a single Conservative Party member was elected in Scotland. Pro-unity advocates say being part of the United Kingdom gives Scotland a bigger say in world affairs through major alliances such as the European Union and NATO, in which a united nation has more clout. They also say continued union means more jobs, stronger financial services, continued use of the British pound and a tradition of partnership that goes back three centuries. Leaders of the U.K.'s three main political parties have been campaigning at a furious pace in recent weeks to persuade Scots to vote "No." Cameron of the Conservative Party, Liberal Democrat Deputy Prime Minister Nick Clegg and opposition Labor leader Ed Miliband have all been making speeches and attending rallies in Scotland. Cameron wrote in an opinion piece last week in the Daily Mail: "Let no one in Scotland be in any doubt: we desperately want you to stay; we do not want this family of nations to be ripped apart." Cameron has said he "emphatically" will not resign if Scotland votes to leave the U.K. His Conservative Party, which has a general election planned for next year, could start re-evaluating its leadership if Cameron is viewed as the man who lost Scotland. Many families living in the U.K. have relatives who live and work in Scotland and England. Under an independent Scotland, travel between the two could become more difficult and involve border checks, passports and even visas. That scenario is unlikely if Scotland is allowed immediate membership in the EU, which permits free movement across member countries. South Sudan the landlocked country in northeastern Africa gained its independence from Sudan in 2011. Born in 9th July 2011, it is the newest Country and whether that status is set to change remains to be seen.